The weather hasn't been that conducive for birding this week, and I've had a couple of outings cut short by high winds and rain squalls. But on Tuesday afternoon, I noticed a Cessna 172 from the local aero club, circling the bay near my residence, and being "nosey" by nature, I drove to a nearby lookout to see what they were looking at. I was fortunate to find that I wasn't the only curious local, and quickly established that the centre of attraction was a Right Whale. Not that I immediately saw it, but I was given a blow by blow account of what I would have seen, if only I'd been there a little earlier! From their description, I felt I'd have an evens chance of seeing it, and after a few 'false' starts, the much barnacled whale emerged briefly, not far offshore from my vantage point, before disappearing again. It wasn't exactly the most energetic whale I've ever seen, as it oh so slowly made its way across the bay, just occasionally surfacing. But they are awesome creatures, this one somewhere in the region of 14 metres or more in length, and well worth the wait. The locals drove off shortly afterwards, but I waited in t he hope that I might get better views (and photographs), deciding to do a bit of birding while I waited. Scanning down the Derwent River, I could see small groups of Australasian Gannets, totalling about 20, strung out across the water a kilometre or more away. Nearer, there were Little Pied and Black-faced Cormorants, and I could hear the yelps of Little Penguins, but never did spot them. At one stage, a group of cormorants flew round the whale, I'm not sure whether it was out of idle curiosity or the chance of a feed, but they only stayed briefly. A few Crested Terns passed the headland, obviously searching the water for food, before one of them plunge dived. This had an immediate impact on the gannets, because within no time they had joined the terns and began diving headlong into the fray. The speed of their reaction to the diving tern was quite amazing. I guess sitting on the water waiting for others to find the location of food, is a good strategy and uses a whole lot less energy. Within a few minutes the flurry of activity was over, and I was left wondering whether to stay, or give it away. At this point, I spotted the first of what proved to be a procession of birds, right in front of me. No doubt they'd been there all the time, but I was too busy casting my eye over the bay to notice. Only a few metres in front of me, was one of a number of weather beaten she oaks (casuarinas), growing out of the side of the cliff face below the lookout. I was effectively looking into the crowns of these small trees, and perhaps it was this that gave the birds a false impression of security. The first bird I noticed was the male Crescent Honeyeater (at left), the bad news was, I'd put the camera in the car to protect it from the occasional light showers. But I needn't have worried, it stayed put, preening itself, while I retrieved my camera and returned. In the next 20 minute s, I photographed, what I think is probably its mate (above right), a pair of Spotted Pardalote, the Little Wattlebird, whose territory I was almost certainly in (bottom right), several Silvereyes and a Magpie. I also had fleeting glimpses of a pair of Yellow Wattlebird, chasing the Spotted Pardalote at high speed through the trees. The only downside to all this, was the Magpie. Although magpies are common in the vicinity, they rarely venture out to this bluff. While photographing it, I realised that it had strands of nylon fishing line round its feet, which it would occasionally peck at. It seemed to be able to feed adequately, but no doubt it had effectively been isolated from its family group, and I did have a feeling of impotency in not being able to free it. On a recent bright and clear morning, I decided it was past time to look for migrant waders. I knew they were about because, on a trip to Sorell a couple of weeks back, I nearly "collected" a flock of around 25 Bar-tailed Godwits as they shot between my car and another coming from the opposite direction, as we crossed the causeway. Knowing that the tide should be high, first stop was at Lauderdale. Well I didn't actually stop, as a quick look at the spit as I drove past, showed that there were only a handful of waders, probably Redcaps and stint, so on to Pipeclay Lagoon. Nearing the Cremorne turnoff, I looked out for 'the' Swamp Harrier which I had seen in the paddock alongside of the road on several previous visits, and sure enough, it was there this morning. With commuter traffic not yet in evidence, I was able to park alongside the paddock, and took the shot of w hat I believe is a female, Swamp Harrier (shown at right). On to Pipeclay Lagoon, where, disappointingly, the tide was obviously not going to be high enough to force the waders to roost. I parked and walked off to look at their usual roost sites beyond the Oyster sheds, with little expectation. There were a few around, drawn, as they often are when they first arrive back, to the the local Red-capped Plovers that nest along the edge of the marsh. I approached the small mixed flock of Curlew Sandpipers and Red-necked Stint (about 9 of the former, and 70-80 of the latter), but much chasing among the redcaps was obviously making them nervous, and they soon took flight. But as usual, the redcaps were soon back, and this drew the 'migrants' back too. I managed a few shots, including the one at left, of a Curlew Sandpiper, still showing the remnants of its summer plumage. You might notice too, that its carrying a band on the right leg, perhaps one of the many banded here, some good few years back now, by the Shorebird Study Group, of which I have fo nd memories. Well I had only been out a short while and with such 'low' high tides, I needed a plan B. So I fell back on my 'usual', Goat Bluff a few kilometres away. At this time of year, Goat Bluff is reaching its most interesting. 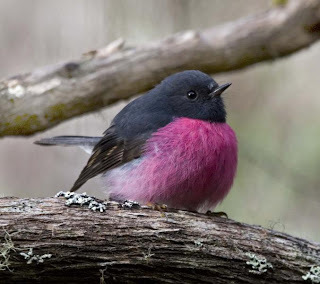 The summer migrants are arriving, and the locals are breeding, or about to. Add that to the few species that are making the most of the last of the flowering shrubs, before heading off to breed, and you have a great mix. I shouldn't forget the sea birds either, with gulls, terns, cormorants and the odd Australasian Gannet. This may all seem idyllic, but you have to be prepared, at times, to share the area with a range of other users, and unfortunately, abusers (but I won't rant on about that). I wandered down the eastern side of the bluff, enjoying the early morning sun, towards the clifftop overlooking a small cove some 60 metres down. Here, recently arrived Tree Martins, and a pair of Welcome Swallows, were hawking for insects in the updraught of the cliff, and ove r the nearby stunted heath, propping occasionally atop the fence wire. While attempting to photograph a swallow on this wire, I spotted, first a Striated Fieldwren, and then a Flame Robin, both on this same wire. Forgetting the swallow, I concentrated on the fieldwren. I have to confess at this point, and some readers may have noticed, that I've published numerous shots of this species over the months. It's becoming, or perhaps already is, the single species that I've photographed most (could it be that I hold an unlikely World record!!!). For some reason, I find them fascinating. Perhaps its because on some visits, no amount of searching will turn one up, on others, as was to be the case on this visit, they appear 'everywhere'. Much of the area is covered by low heath, much of it less than knee high, interspersed with other dense plants, such as acacia and correa, rarely more than a metre high. So their ability to elude birders looking out for them, is legendary. (I note that the Bird Atlas does not appear to have any records for anywhere on the South Arm peninsula, where it is in fact quite common). Conversely, or perhaps, perversely, I've walked up to within a couple of metres of a calling fieldwren, without seeming to faze it. The photo at bottom left, illustrates, perhaps, their ability to blend into the 'country', and I watched this bird as it foraged among the foliage and grasses, occasionally breaking cover to run along the narrow tracks, before 'plunging' once more into cover. I shouldn't neglect to add, that other species present on the bluff included Fan-tailed and Horfield's Bronze-Cuckoo, Yellow-tailed Black Cockatoos, many Yellow-throated and Newholland Honeyeaters and soon to be departing, Crescent Honeyeaters. Brown and Yellow-rumped Thornbills, Scarlet and Flame Robins, flocks of Silvereye, and pairs of both Spotted and Striated Pardalotes. Soaring White-bellied Sea Eagle and Swamp Harrier, and singles of Brown Falcon and Brown Goshawk. An interesting morning, despite the earlier disappointment. 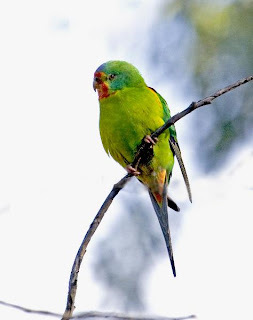 The Kingston area, just South of Hobart, must be the Tasmanian equivalent of Mecca, for a range of parrot species that have had more than passing assistance from humans. For many years the home of about 25 or so Galahs, believed to be the progeny of birds released from a ship at Port Huon in 1922, they have been joined by Long-billed and Little Corellas, and most recently by Rainbow Lorikeets. The Galah numbers have burgeoned too, no doubt joined by aviary escapes and possibly trans Bass Strait migrants. Apart from the odd vagrant, these species would not normally include Tasmania as part of their distribution range. A few days ago,I spent a morning on the Kingston Golf Course (after seeking permission from the secretary/manager), armed with a camera rather than golf clubs, and wandered round. 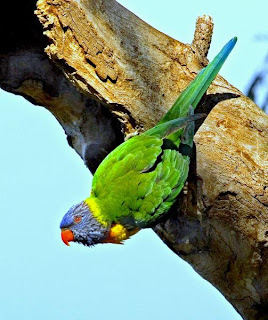 I wanted to get a few shots of the Rainbow Lorikeets, having noted half a dozen of them in the Blue Gums along the nearby beachfront, and having heard that they frequented t he golf course. 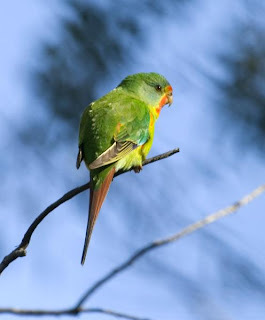 As I wandered back to my car from the clubhouse, I could already hear the 'strains' of the numerous Musk Lorikeets in the nearby gums, I could also hear a few Swift Parrots calling from among them, but this was the first and last intimation of their presence. I drove down to the club's works area, flushing several Eastern Rosellas from the track side, and noting several groups of Wood Duck and flocks of Galahs, feeding on the verdant fairways. The works area abuts Brown's River, and I walked over to the river bank. My first sighting there was a solitary Australasian Grebe, splashing its way over the water surface, towards me! Concentrating on that, I had failed to see the single Little Pied and Two Little Black Cormorants, roosting on a dead tree branch, only a few metres away, obviously used to the to and froing of the ground staff, and unfazed by my close approach. With obviously so many groups of birds about, I just wandered "higgledy piggledy" round the course, drawn to whatever seemed like a photo op.. I photographed Galahs, Eastern and Green Rosellas, Musk Lorikeet, Noisy Miners, Australian Magpies and Wood Duck in quick succession. However, the Rainbow Lorikeets were proving rather more elusive, although I had a brief view of a couple passing rapidly on to distant gums. I then spotted a corella among a flock of around 30 Galahs, and closed on this. It proved to be the only Little Corella that I recorded (photo at bottom left). It was keeping company with a very anaemic coloured and similar sized Galah, a species with which they occasionally cross breed, at least in aviary situations. 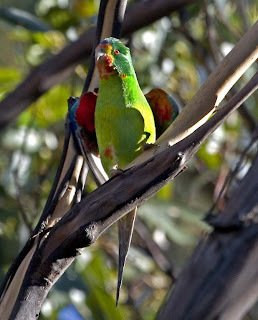 I had just about given up on the 'rainbows' when I was drawn to a dispute between Eastern Rosellas and Musk Lorikeets, high in a large gum. I tried to get a few shots, but the 'easterns ' flew off. I stood under the trees contemplating leaving, the increasing numbers of golfers were a distraction, when I heard a 'rainbow' call from almost overhead. And there, unnoticed by me, were a pair of Rainbow Lorikeets, sussing out a nest hole or 'spout' at the end of a hollow branch, some 10 metres up. A coupl e of shots before they disappeared deep inside. I waited for what seemed an eternity, (I'm really not the patient type that people sometimes suggest!). 10 minutes or so later, they emerged, and I shot a few more images including the photo at right of a bird at the possible nest entrance, and the image at top left, before they flew off. Ambling back along the river bank, I could see a flock of Long-billed Corellas lined up along the power lines overlooking the children's playground, on the other side of the river, waiting for one of the frequent 'handouts' of food. Every now and then, amid much screaming, they would all take to the air, and from my observations this usually indicates a nearby raptor, often a Brown Goshawk. I have mixed feelings about the corellas and 'rainbows'. There is no doubt that many are aviary escapes, or their progeny, and they have the potential to become serious pests. 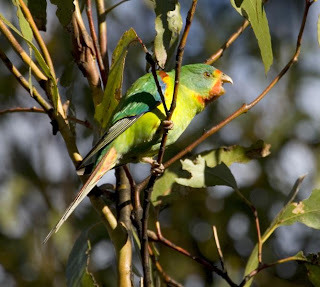 There is also the question of what impact they may have on our native species, the Swift Parrot in particular. I suspect that they are already past being able to 'control' their numbers, and I'm not sure that it would be supported by well meaning, but perhaps, ill informed members of the public. I have no doubt that although we use the expression "aviary escapes", many of these parrots have in fact been deliberately released when the owners tired of them. All too frequently I notice other fauna that's been dumped, ranging from chickens and ducks, through to cats, many of them in conservation areas.